Synopsis: Parker Shelton pretty much has the perfect life. She’s on her way to becoming valedictorian at Hundred Oaks High, she’s made the all-star softball team, and she has plenty of friends. Then her mother’s scandal rocks their small town and suddenly no one will talk to her. But how far is too far before she loses herself completely. Parker Shelton was always a good Christian girl.With good Christian friends and a clean reputation. That is until her mother comes out as a lesbian and runs away with the church's secretary. Like the tagline says, one strike-- to her facade of a perfect life that is-- and she's out. Parker looses her grip on who she is, to become the person she believes everyone needs her to be. 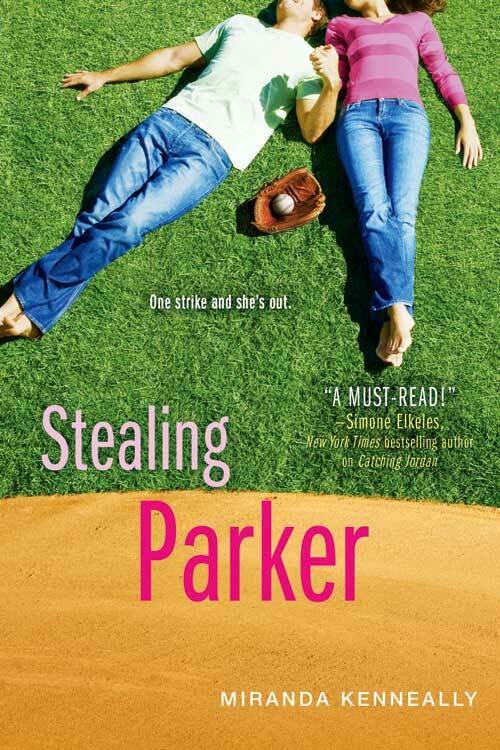 Stealing Parker is the follow up to Kenneally's Catching Jordan. Like Catching Jordan this novel is sports themed however Stealing Parker is less about the sport and more about the characters. Parker is your average self-conscious snarky teenager. She is so concerned with what everyone thinks and things never seem to turn out the way they should for her. She loses weight, stops playing softball and starts making out with more boys just to confirm to everyone she is not a lesbian like her mom. One of the characters that stood out to me was Brian Hoffman, the 23-year-old baseball coach she starts a secret relationship with while she is managing the baseball team. He was supposed to be a baseball player, but he wasn't a good enough in college. He has a Master's degree, but is back at home living with his parents because he can't afford to move out. I think this speaks so much to what is going on with a lot of 20 somethings. When you learn all the high school dreams you had don't always come true. I mean he is a jerk a lot of the time, but I think that comes from the frustration with where he ended up. This tension plays up especially well with him risking losing his job to see Parker. The only thing that really bothers me about this book personally are all the pop culture references I mean, I liked some of them, like how Parker's friends Corndog and Drew like to go to a diner and pretend like they are on Seinfeld and talk about nothing. However more contemporary references to things like Mila Kunis, Far East Movement always take me out of books for some reason. Stealing Parker is a modern, heartfelt follow up to Catching Jordan about learning to love again. Side Note : Miranda Kenneally has received a three book deal with Sourcebooks Fire. Next up is a novel entitled Racing Savannah. A secondary character from Stealing Parker will feature in the novel. * All quotes are from ARCs and may not reflect the finished copy. ARC received from BEA for review. Thanks to the publicist at Sourcbooks for findng a copy ! What a neat concept. I can see someone losing themselves completely after a shocker like that. And how could her Mom justify running off and leaving her child behind? Brian sounds like such a realistic character, especially considering this seems to be a regular occurrence for today's recent college grads. I like the concept of this one, sounds interesting. I'm pretty excited to read this, though I have yet to read Catching Jordan. It sounds like a good, solid story, and I'm interested to see where she takes her characters! It's a very interesting book ! I don't think you need to read Catching Jordan to understand this novel. Yeah, the book delves more into why she left and how it affects the Shelton family. I don't want to give away too much ! Awesome review. I think it is good to know that it doesn't dig deep into the issues. For some people that might be a good thing. Either way, I love feeling more informed.